Ever since I started eating crispy nuts – I can’t go back. Regular nuts just don’t have the flavor that crispy nuts have – oh, so yummy! Several years ago when living in Colorado, the health food store there had tamari pepitas and I have craved them and tried to duplicate ever since – with no luck until now! Are you asking what are crispy nuts? They are raw nuts that have been soaked and then dried. This is how traditional people prepared their nuts. Nuts and seeds contain phytic acid and enzyme inhibitors. 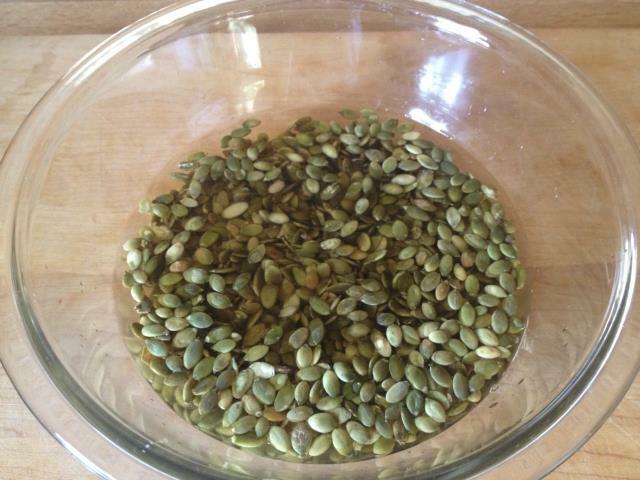 These enzymes are useful to seeds and nuts because it prevents them from sprouting prematurely. But they are very hard on our digestive system. By soaking your nuts and seeds in a brine it helps encourage the production of beneficial enzymes and these enzymes increase vitamins, especially B vitamins and make the nutrients easier to absorb. 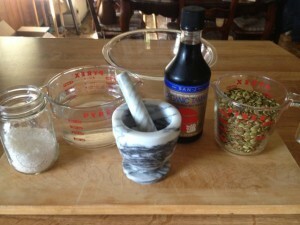 I started soaking my grains, flours, nuts and seeds after reading Sally Fallon Morell’s book Nourishing Traditions. I cannot recommend this book highly enough – check one out at the library and then go buy yourself a copy – it will become your go to reference book and cookbook! 1. 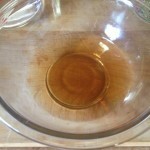 Dissolve the salt in the water, start with 2 cups of water. 2. Add the tamari (or other seasoning or no seasoning) to the salt solution and mix. 3. 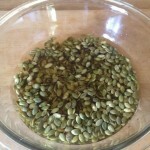 Add the pepitas, making sure they are covered with water by at least 1″. 4. Leave the nuts on the counter for at least 7 hours or overnight. 5. 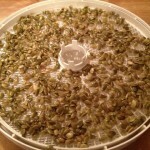 Drain the nuts and either place on a baking sheet and dry in the oven 12 – 24 hours at a temperature no warmer than 150 degrees or you can use a dehydrator. 6. Toss at least once while drying. You want to make sure that the nuts are completely dried or when you store them they could mold. 7. Once completely dried, allow to cool and store in an airtight container. These go really fast in our house. 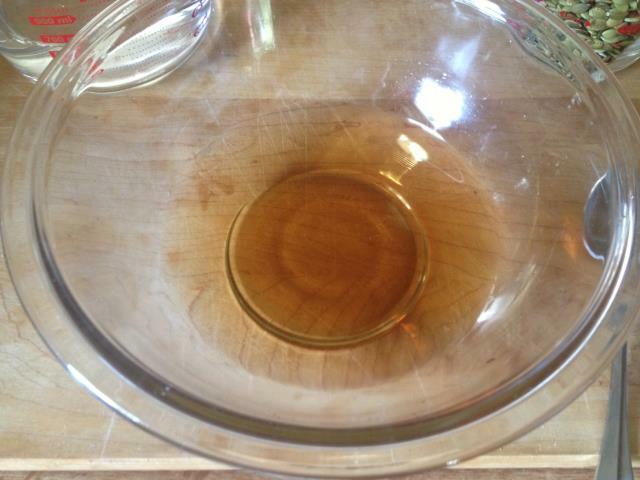 For another version, try the following recipe and follow the directions from above. 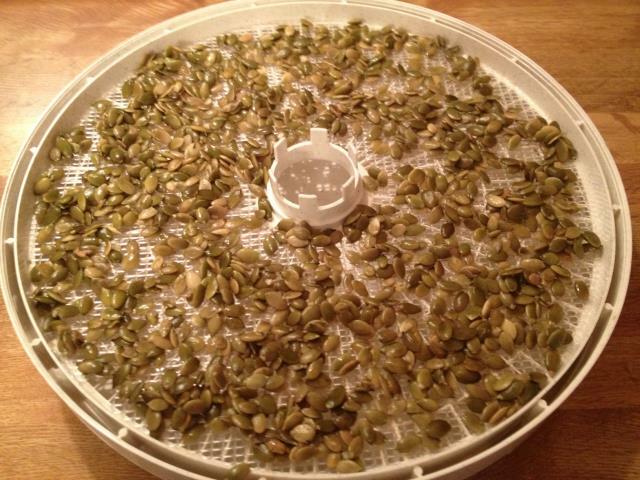 This entry was posted in Dehydrating, Preserving, Raw Food, Recipes, Snacks and tagged crispy nuts, nuts, pepitas. Bookmark the permalink. Great job on explaining crispy nuts. I had no idea that one uses so little tamari to get a tamari flavor. Like you, I love tamari on nuts!! 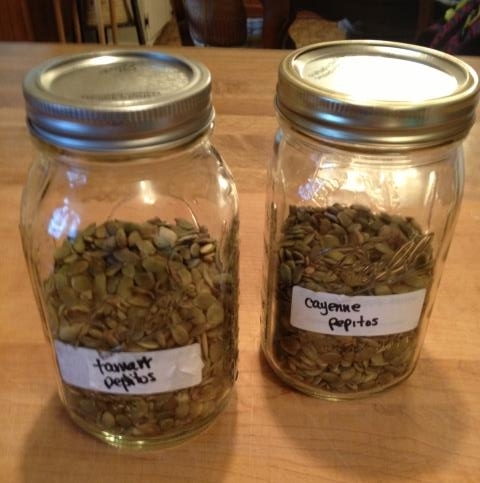 Have a small jar of pepitas with the Aztec recipe from Erin. Very tasty. They look yummy and pretty darn easy!